For the first time ever, Nicholas Yust has made his world-renowned metal artwork available as a line of limited edition metal giclée prints. This first edition includes a series of 290 of each of the following eight designs. Every piece in the collection is prepped, embellished, printed, numbered and hand signed by Nicholas Yust himself for the ultimate authenticity. Isomantic Composition is a lovely, inspiring contemporary art piece. It began with sunburst style design, which is one of Nicholas's original, hand-ground metal art piece known as 'Isomantic.' He created the original grind pattern on a metal panel, had it professionally photographed in high-definition, then used an in-house digital acrylic printing process to apply it to another aluminum sheet. Flexure Composition began with a high resolution photograph of Nicholas's always intriguing and attractive 'Flexure' grind pattern, which features a large, wavy starburst design. He has applied the gicl��_��__��_��___��_��__��_��____��_��__��_��___��_��__��_��_____��_��__��_��___��_��__��_��____��_��__��_��___��_��__��_��______e printing process commonly used to reproduce original paintings and applied it with a metal substrate to reproduce his original metal artwork. Conduction Composition is a metal art gicl��_��__��_��___��_��__��_��____��_��__��_��___��_��__��_��_____��_��__��_��___��_��__��_��____��_��__��_��___��_��__��_��______e print. It began with a beautiful original art piece; the broad, circular design known as 'Conduction.' He created the original grind pattern on a metal panel, had it professionally photographed in high-definition, then used an in-house digital acrylic printing process to apply it to another aluminum panel. 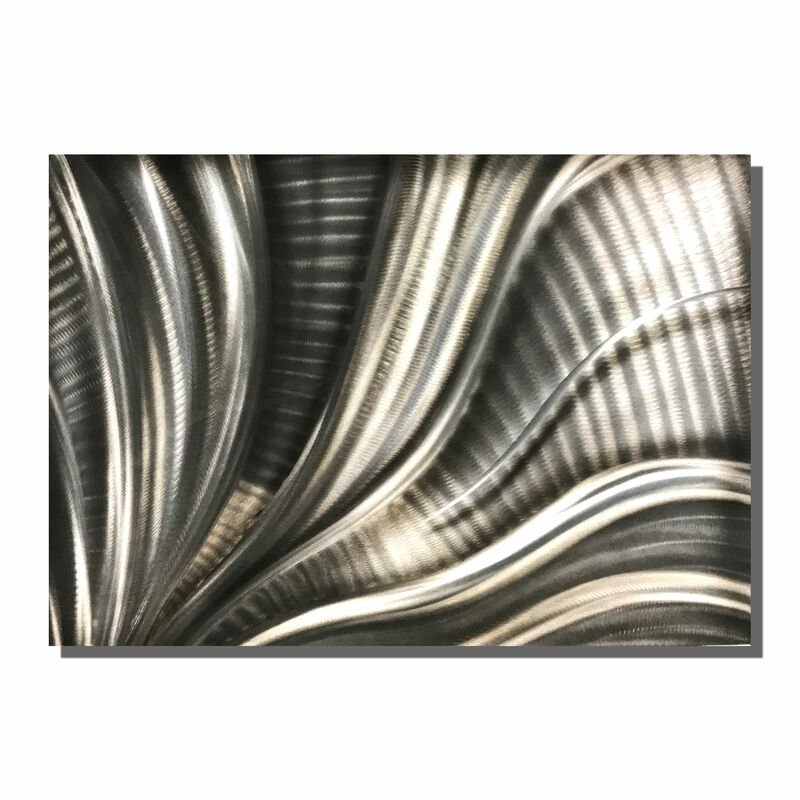 Electric Fields v2 Composition is an exciting metal art piece with a wispy pattern digitally printed directly onto an aluminum panel. It is based on one of Nicholas Yust's most popular original metal art pieces (Electric Fields v2) which is carefully and precisely hand-ground in Nicholas's studio. He has photographed the original in high definition to allow it to be reproduced for a broader market. Polar Encapsulation Composition is an energetic metal art piece with a pattern digitally printed directly onto an aluminum panel. It is based on an original metal art piece, hand ground by Nicholas Yust and photographed in high definition to allow it to be reproduced for a broader market. Tantalum Composition began with a high resolution photograph of Nicholas's extremely popular 'Tantalum' starburst grind pattern. He has applied the gicl��_��__��_��___��_��__��_��____��_��__��_��___��_��__��_��_____��_��__��_��___��_��__��_��____��_��__��_��___��_��__��_��______e printing process commonly used to reproduce original paintings and applied it with a metal substrate to reproduce his original metal artwork. Fusion Composition is a unique, photographic metal art piece. As you may have gathered, it started with Nicholas's most popular design, the large, sweeping wave known as 'Fusion.' He created the original grind pattern on a metal panel, had it professionally photographed in high-definition, then used an in-house digital acrylic printing process to apply it to another sheet of metal at the desired size. This is an incredibly rare opportunity to take advantage of the very first line of "Limited Edition Giclees" that Nicholas Yust has ever done. He very recently installed a large format, ultra high definition, top of the line printer in his studio that allows him to create his own line of high quality limited edition prints on metal, crafted right here in his own studio with his personal signature, edition number, and certificate of authenticity included with each piece. The edition size is 290, and as mentioned this is the first time in his career a world-renowned metal artist that he has offered a limited edition giclee print run, so this is a wonderful opportunity to own a piece of contemporary art history. To produce the piece Nicholas creates a manual artistic grind pattern on a metal panel, photographs it in high-definition, then uses a digital acrylic printing process to apply the pattern to another sheet of metal at the desired size. He then signs the corner, numbers the edition, and completes the certificate of authenticity to include with the artwork.